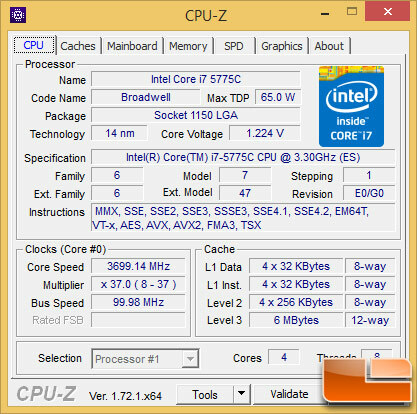 The Intel Core i7-5775C is capable of hitting 3.7 GHz by default thanks to the Intel Turbo boost mode. 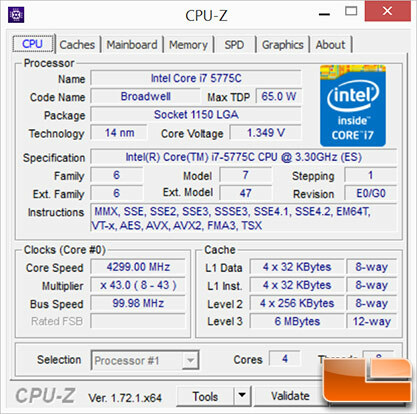 We overclocked the Intel Core i7-5775C processor by simply increasing the multiplier and raising the voltage on the processor when needed. The UEFI microcode for enabling eDRAM selections and overclocking was not available in the build for the board that we have, so we left that alone for the time being (We’ll do an article on that later). By just raising the multiplier we were able to get to 4.1 GHz without needing to increase the voltage. To hit 4.2 GHz we had to increase the voltage to 1.3V and then to hit 4.3GHz we had to increase it again to 1.35V. We were able to get 4.4 GHz up and running on the desktop, but it would crash in very CPU intensive benchmarks. We went up to 1.425V on the processor and couldn’t get it stable at 4.4 GHz before calling it quits and we just benchmarked everything in our test suite at 4.3GHz. We later learned that you can put more voltage to the processor without blowing it up right away and was able to get 4.4GHz stable at 1.475V. If you want to run 4.6-4.7GHz on one of these processors you need to run around 1.6V on the core and that is something we weren’t interested in doing and you’ll see why when we get to the power consumption section! 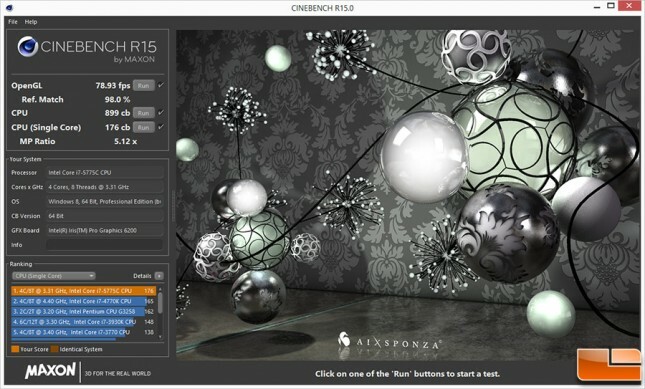 With the Intel Core i7-5775C processor running 4.3GHz we were able to score 899 on the CPU test in Cinebench. We got a score of 785 stock, so this is a nice 14.5% performance gain from this 600MHz clock frequency boost that equates to a 16% overclock. All of the performance charts in the review show the Intel Core i7-5775C at both stock and overclocked (4.3GHz), so please reference those in the pages ahead to see how the chip performs in a wider variety of benchmarks. With the Intel Core i7-5775C running at 4.3 GHz with 1.35V to the core we hit 68C on the Corsair Hydro Series H105 CPU Water Cooler that we were using on the test bench. Not a bad temperature at all for this overclock! Let’s see how the Intel Core i7-5775C Broadwell processor performs at both stock speeds and at 4.3GHz!